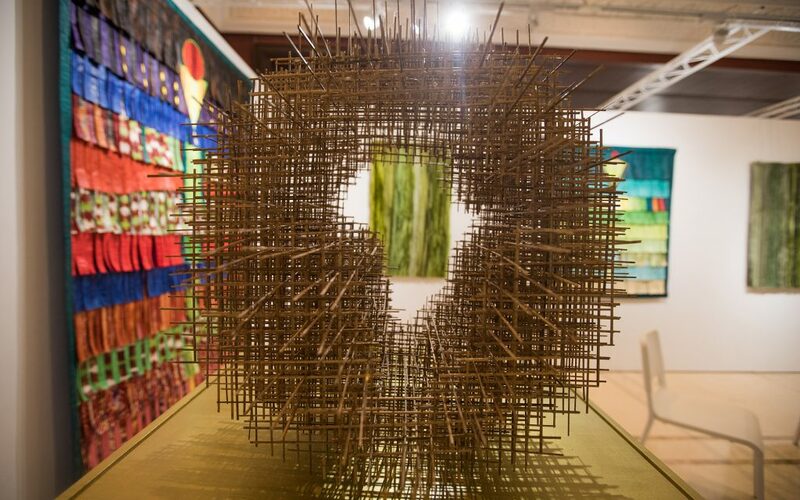 Installation image, Hassan Darsi, 1-54 Contemporary African Art Fair, Marrakech 2018. Photograph Adnane Zemmama. This talk looks at three current projects based in Morocco that support and develop multiple and diverse forms of artistic production both in that country and from the broader African continent. Through an informal conversation between a curator, a collector and an art fair director, the evening explores the similarity of aims, and differences in methodologies between the recent 1-54 Art Fair in Marrakesh, the forthcoming Casablanca Biennial and the newly inaugurated Museum of Contemporary Art Al Maaden (MACAAL). These examples will provide a springboard to explore the present situation, urgencies and possible futures in relation to the art market, public institutions and art ecologies in the region. This talk is part of Delfina Foundation’s thematic programme, Collecting As Practice. Othman Lazraq is the Director of Fondation Alliances and President of the Museum of African Contemporary Art Al Maaden (MACAAL), Marrakech. The newly opened museum is dedicated to the promotion of African contemporary art through its continuous support for leading artists from Morocco and neighbouring countries and the public display of their works. The museum’s collection, consisting of digital art, painting, sculpture and video, illustrates the Fondation Alliances’ commitment to providing universally accessible contemporary art, while supporting cultural development in Morocco. The independent, not for-profit contemporary art museum is one of the first of its kind in North Africa. In October 2013, Touria founded 1-54 Contemporary African Art Fair, the leading international art fair dedicated to contemporary art from Africa and its diaspora with annual editions in London, New York and Marrakech. Born and raised in Morocco, Touria El Glaoui holds an MBA in Strategic Management and International Business from Pace University, New York. She began her career in the banking industry as a wealth management consultant before moving to London in 2001 where she undertook various business development positions in the Telecom/IT industry. She has spent over five years working between London, various African countries and the Middle East in a business development capacity. She is a member of the Executive Committee of The Friends of Leighton House, London and a trustee of the Marrakech Biennial. Touria El Glaoui is the daughter of one of the most revered living Moroccan artists, Hassan El Glaoui. Parallel to her career, she has organised and co- curated significant exhibitions of her father’s work including a major retrospective in Casablanca and Meetings in Marrakech, a joint exhibition with Winston Churchill’s paintings hosted at Leighton House in London and most recently, La Mamounia in Marrakech, as part of the 2014 Marrakech Biennale. Christine is a Research Fellow in Contemporary Art at the University of Central Lancashire where she works on Making Histories Visible, an interdisciplinary visual arts research project led by Lubaina Himid MBE artist and Professor of Contemporary Art at UCLan. Her research focuses on contemporary African and Diaspora arts, 1980s Black British arts, representations of the body and gender in art, design and sound art. In 2017 Christine was appointed artistic director of the 4th International Biennial of Casablanca. She is also the founder of Cameroon’s photography project Yaounde Photo Network. Christine’s touring exhibition Sounds Like Her, showcasing women’s practices around music and sound art, opened at New Art Exchange, Nottingham in October 2017. Her previous projects include: Still unresolved and very much ongoing, Yamamoto Keiko Rochaix, London (2017); Murder Machine, Ormston House, Limerick, as part of the 37th edition of EVA International – Ireland’s Biennial of Contemporary Art curated by Koyo Kouoh (2016); Curators’ Series # 8: All Of Us Have A Sense Of Rhythm, David Roberts Art Foundation, London (2015); WHERE WE’RE AT! Other Voices on Gender, BOZAR, Brussels, as part of the Summer of Photography (2014); Gideon Mendel: Drowning World, Tiwani Contemporary, London (2013), and the 10th edition of Dak’Art – Biennial of Contemporary African Art, IFAN Museum and National Gallery, Dakar (2012). Eyene is a member of the Nouveau Musée National de Monaco’s Scientific Committee led by NMNM Director Marie-Claude Beaud. She is also member of the Acquisition Committee of the Fonds Régional d’Art Contemporain (Frac) Reunion Island led by Béatrice Binoche. From the latter was born an interest in insular contexts and overseas relationships that will be a key element of her research as part of the biennial.